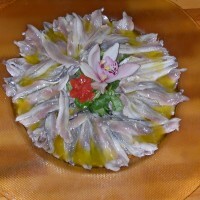 Take the anchovies, remove the head, open them and remove the bone gently, rinse them and put them in a colander to drain. Then lay them in a baking dish, pour the lemon juice and salt to taste. Put in refrigerator to marinate at least an hour. Now drained fillets from lemon juice, arrange on a serving dish, sprinkle with olive oil and a sprinkling of parsley. For those who loved her more determined tastes can add a clove of minced garlic and red pepper. Decorated affecting a lemon, or cutting it into slices.